Interval training involves a combination of high and low-intensity training interspersed with rest or recovery periods within a single workout session. Compare to the "steady state" cardio, interval training can increases fitness and burn more calories over a short period of time. Scientific studies have shown that interval training is one of the most effective way to burn fat and lose weight. 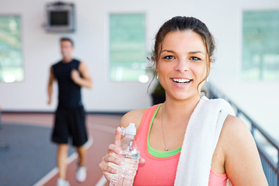 Interval training works both the aerobic and the anaerobic system. During the high intensity efforts, the anaerobic system uses the energy stored in the muscles (glycogen) for short bursts of activity. Anaerobic metabolism works without oxygen, but the by-product is lactic acid. As lactic acid builds, the athlete enters oxygen debt, and it is during the recovery phase that the heart and lungs work together to "pay back" this oxygen debt and break down the lactic acid. It is in this phase that the aerobic system is using oxygen to convert stored carbohydrates into energy.It's thought that by performing high intensity intervals that produce lactic acid during practice, the body adapts and burns lactic acid more efficiently during exercise. This means athletes can exercise at a higher intensity for a longer period of time before fatigue or pain slows them down. Scientific studies indicates interval training can results in greater fat loss than steady-state workout.​According to the American College of Sports Medicine, more calories are burned in short,high intensity exercise. 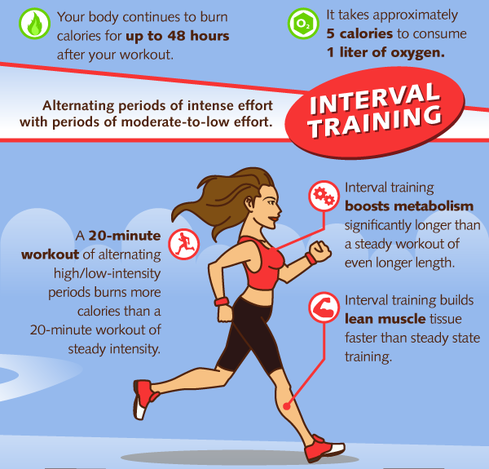 If you are counting calories burned, interval training is better than long, slow endurance exercise. Researchers find out that inverval training uses both aerobic and anaerobic metabolism(glycolosis) to help generate enough energy to fuel intense efforts. 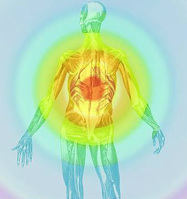 It is far more superior to boost metabolism and improve muscular endurance than steady speed exercise.